To be released to the public on July 30, Minelab have unveiled their brand new pinpointer probe: the PRO-FIND 25. Giving you the ability to locate coins, rings, treasure and gold with speed and accuracy, the PRO-FIND 25 uses Detector Interference Free (DIF) Technology to enhance your detector, be it Minelab or another brand – making it an essential part of your detecting tool kit. Minelab’s new pinpointer will also include two mode operation, auto power off after 8 minutes and LED flash light. When it’s released on July 30, will you be getting the PRO-FIND 25? 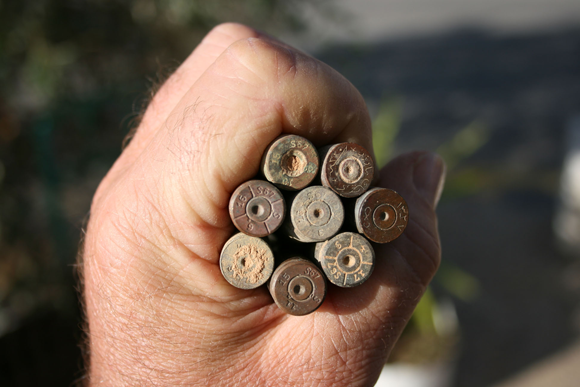 Let us know what you think and share your thoughts about Minelab’s new pinpointer on the Joan Allen Facebook page. If you are a regular visitor to the Joan Allen Facebook page then you should be aware of Julian-Evan Hart and all of his latest finds. 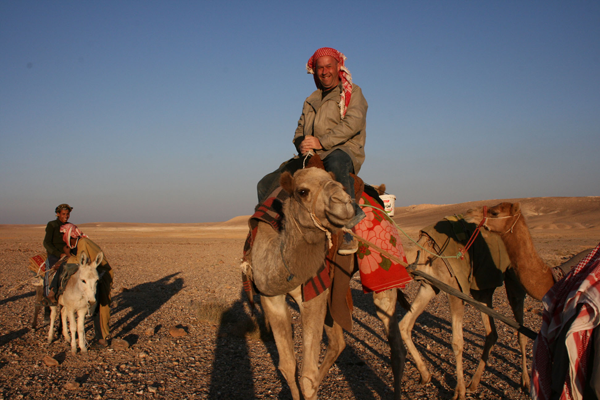 This month on the Joan Allen blog we featured an introduction of Jules’ trip to Jordan in the Middle East and his metal detecting exploits in the country. 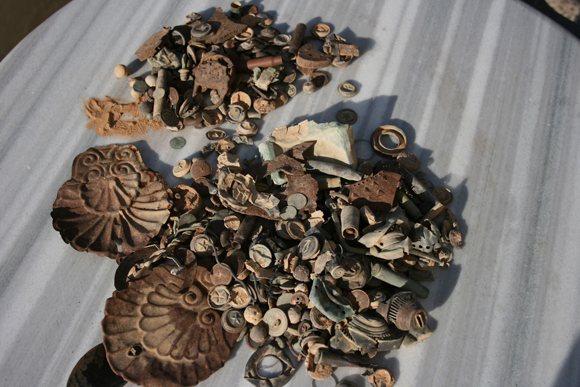 On his travels, Jules found everything from late Roman mosaics, relics from the Ottoman empire, Venetian coins, to shell casings and World War I relics. He even did the typical tourist photo on a camel! 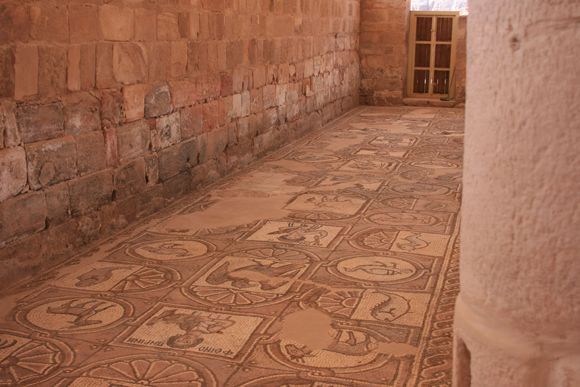 A wonderful late Roman mosaic in the lost city of Petra. 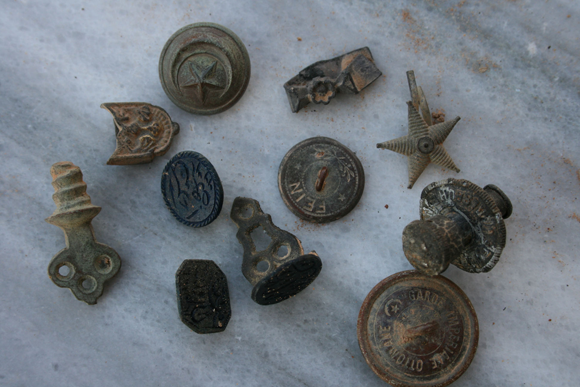 The relics of war – here we see numerous small finds, from shell casings, buttons oil lamp wick sections etc. Various head stamps from Turkish Mauser rounds. Ottoman soldier losses from World War one, here we see, personal seals, a small gilded chape a Turkish star and crushed finger ring with a floral design bezel. 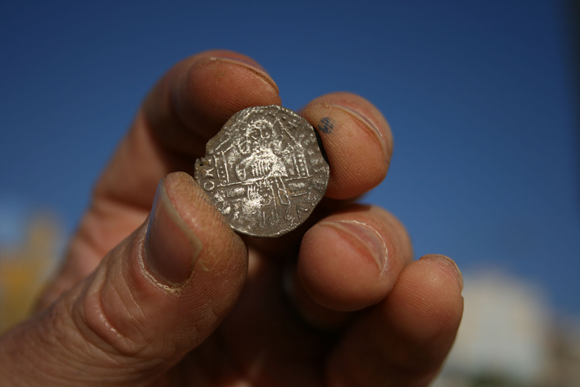 Didn’t expect to find this – a Venetian coin high up on a remote Jordanian mountain side. 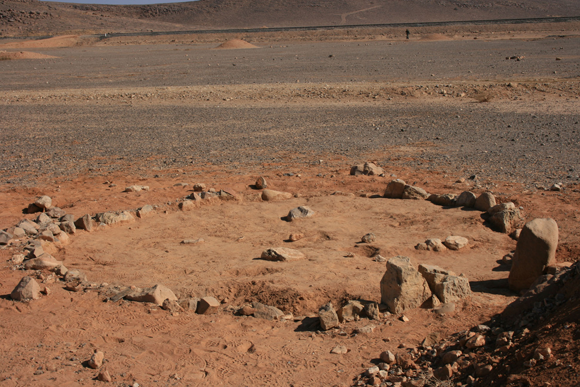 Incredible in 1917 a group of Ottoman soldiers placed some stones around one of the tents in their encampment over nine decades later the stones remain the same…untouched…..hundreds of Ottoman soldiers buttons were found in this area. 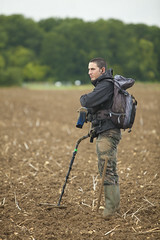 “As detectorists sharing with others our experiences and finds should be considered to be a big part of our hobby and enjoyment. Sharing gives other people pleasure in seeing what you have found and also allows academic research to progress. Whilst I was in Jordan we shared our finds rather publicly on a table just outside the hotel doors….tourists and locals came over in considerable numbers, some of them are shown in the photo (see above). Have you been detecting anywhere recently? Share your finds and follow all of Jules’ latest exploits as well on the Joan Allen Facebook page. 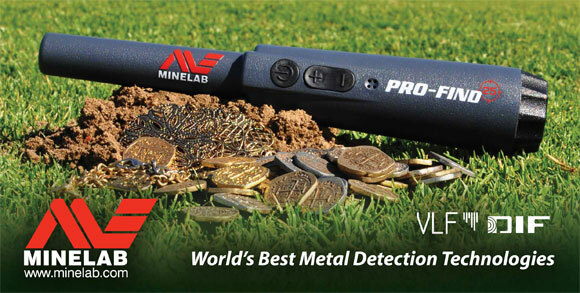 Minelab launched their revolutionary new detector last month amid a flurry of hype from detectorists around the world. 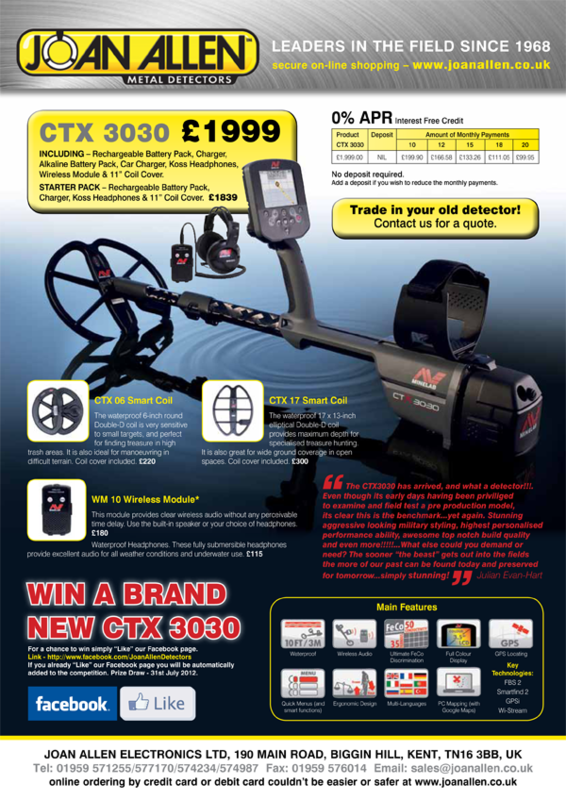 The CTX 3030 is a real game-changer in detecting and now you can win one courtesy of Joan Allen. We are giving you the chance to win yourself a CTX 3030 and have the ability to detect anywhere on the planet. Normally worth £2,000, you can win one for free on the Joan Allen Facebook page. You can go detecting anywhere with this versatile TREASURE detector. You have the flexibility of land and underwater detecting as the CTX 3030 is waterproof to 10 ft (3 m). Have the freedom to detect without your headphones being attached to your detector. With the WM 10 Wireless Module you have the choice of using the internal speaker, supplied headphones or your own favourite headphones. With Ferrous (Fe) and Conductivity (Co) target resolution, plus adjustable Tone ID Profiles, you can detect the targets you want to and ignore the rest. With Target Trace and Target Separation, you can identify multiple targets simultaneously for accurate detecting results. See where you have been and where you are going by using the Map screen and Navigation Tool. New GPS functions, such as GeoTrails, WayPoints, FindPoints and GeoHunts, allow you to leave your handheld GPS at home! “The CTX 3030 has arrived, and what a detector!!! Even though its early days, having to examine and field test a pre-production model, it’s clear this is the benchmark… yet again. You have until July 31 to enter the competition, so hurry! For more information about the CTX 3030 and the full list of features, visit the Joan Allen website.